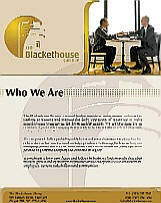 The Blackethouse Group is a team of leading executives, entrepreneurs and investors seeking to acquire service, distribution, consumer products or niche manufacturing companies with revenues between $5-25 million. We can provide full or partial liquidity to current owner/managers wanting to retire or to reduce active involvement in daily operations. We can also partner with business owners looking to bring on additional executive leadership, board members, and growth capital to help the company achieve its full potential. We maintain a long-term focus and believe in business fundamentals: that lasting, exceptional value is created for customers, employees, owners, stakeholders and communities through growth, superior value and operating best practices. Copyright © 2015 The Blackethouse Group. All Rights Reserved.